The daltile urban metals brick joint 12 in. x 12 in. 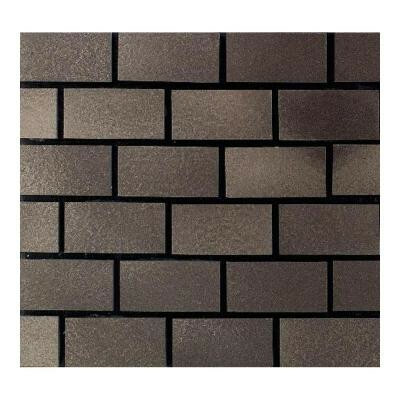 Bronze metal mosaic tile features durable metal construction and an impervious water absorption rating for use with a variety of indoor and outdoor projects. Designed for wall and backsplash use, this tile has a textured, unglazed finish and is frost resistant to suit your needs. This beautiful tile has a metallic bronze color with a uniform appearance in tone to help add visual appeal to your space. These tiles are made with a patented material that integrates premium metal with ceramics and special polymers. All tiles are individually cast and polished. Surface variations are inherent to the process and add to the natural beauty of the product. You can buy this product in our internet market. We will be glad if you make the right choice.